The Xenomorphs from the Alien film franchise are the most dangerous species in the universe. The Predators from the Predator film franchise are the greatest hunters in the universe. Since both were owned by Fox, it made sense that at some point they would cross over. After an Easter egg in Predator 2 showed a Xenomorph skull in a Predator trophy cabinet, fans couldn’t wait to see the characters face off, leading to the creation of comic book crossovers and games. When the film finally came out, it was disappointing… but still entertaining for many. While the debate of which character was better was never resolved (technically, it never can be in any film with “Vs.” in the title, for fear of upsetting fans of the loser), it did allow for a classic showdown or two. 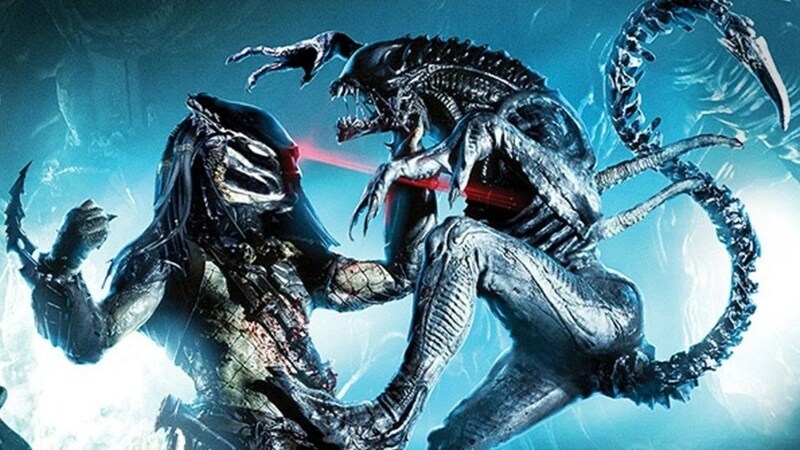 The Xenomorphs proved to be tenacious killers who function better in packs, while more was revealed about the Predator culture which proved why they’re considered so tough. Unfortunately, any goodwill the film earned was used up when an underwhelming sequel was made. Two modern day horror movie icons, both so well-known to fans that the film could just use their first names to sell it. The crossover took years to happen because the characters belonged to different studios. When New Line – owners of A Nightmare On Elm Street’s Freddy Krueger – finally got their hands on Friday the 13th’s Jason Voorhees, they immediately teased a crossover at the end of Jason Goes To Hell: The Final Friday. Except then creator Wes Craven returned to make a new Freddy film, New Nightmare, which delayed production of the crossover. That led to Jason X being made to keep that character busy. However, when the time was right, the characters finally met. Despite some clever storytelling to explain how the characters existed in the same world, the first half of the film is disappointing. 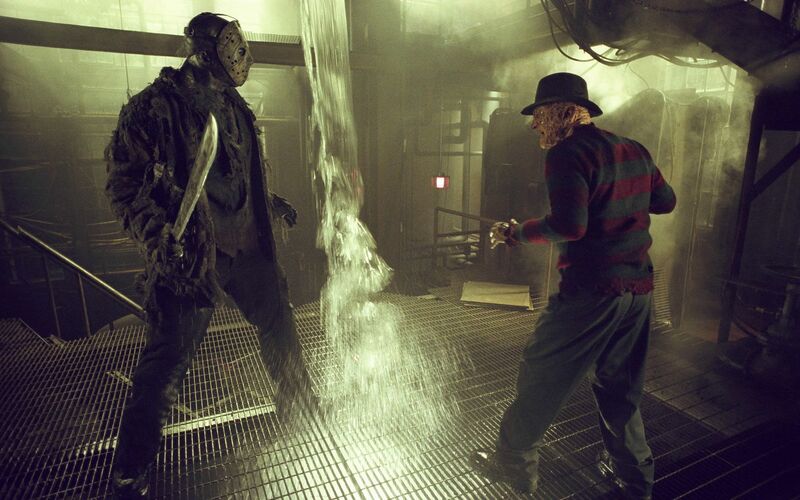 The second half, when Freddy and Jason go toe-to-toe in battle, is surprisingly fun and pulls out all the stops. It’s a battle spanning both the world of dreams as well as the real world, with each of them getting moments to shine. Again, there’s no clear-cut winner, but it did enough to make fans want more… allowing for them to square off against Evil Dead’s Ash in comic books. Who could have predicted the awesomeness of The LEGO Movie? Given the many franchises which LEGO has teamed up with in recent years, it shouldn’t have been that surprising. The film starts out with a typical Lego city and its inhabitants, as we’re introduced to average guy Emmet. But the minute Lego Batman shows up and makes it clear that he’s one of the central characters, you know this isn’t what you expected. Enter Gandalf, Dumbledore, NBA players, the Ninja Turtles, Milhouse from The Simpsons, and a Millennium Falcon packed with Star Wars characters and minds were blown. The problem with the Lego movies is that you can’t play with the characters. The LEGO Dimensions console game fixed that. A toys-to-life system not only allowed you to buy characters from various franchises, but you could have them interact on your home console system. Lego Movie and Lego Batman characters are just the beginning. Homer Simpson, Doctor Who’s Doctor, Ghostbuster Pete Venkman, Back to the Future’s Marty McFly, Scooby-Doo, E.T. The A-Team’s BA Baracus, Knight Rider’s Michael Knight and KITT, Sloth from The Goonies, Sonic the Hedgehog and so many more can join forces on screen and interact in unique ways. It’s a game which not only pays tribute to so many pop culture icons but also provides levels of gameplay accurate to their respective characters. The Scooby-Doo level is more cartoonish, as is the Simpsons level. The Wizard of Oz level changes to sepia colouring when you go off the Oz map and visit Kansas. Plus, many of the characters are voiced by the original actors who played them, and the music for the various levels is from the franchises too. For fans of ‘80s pop culture, in particular, it’s been a dream come true. In the world of gaming, the Final Fantasy series is legendary. Then they added Disney characters. Actually, they added just about all the Disney characters. Despite a too-complex storyline, the basic idea was that all the separate Disney film and TV show worlds were being conquered by Sleeping Beauty’s mistress of all evil, Maleficent. 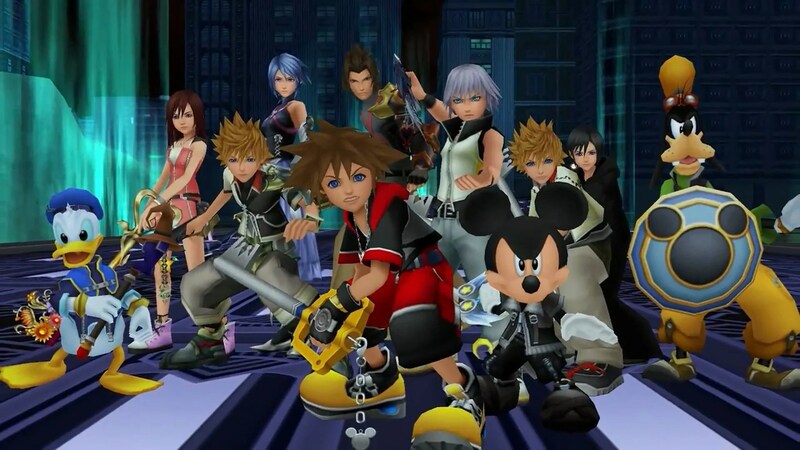 With good King Mickey having mysteriously disappeared, it’s up to the player’s human character Sora to team up with Donald Duck and Goofy to restore order. That sounds simple enough. But just imagine… with each level looking like the movies and shows you’ve loved since childhood, interacting with characters often voiced by the original actors too, it was like a dream come true. The variety of worlds and characters is stunning and diverse, offering everything from Aladdin and The Lion King to classic Winnie the Pooh and stop-motion style Nightmare Before Christmas. Even something as ridiculous as hanging out with Little Mermaid’s Ariel or finding the 101 Dalmatians was enough to make fans and critics alike smile. When it comes to animation, there’s a vast difference between the two legendary studios of Disney and Warner Bros. 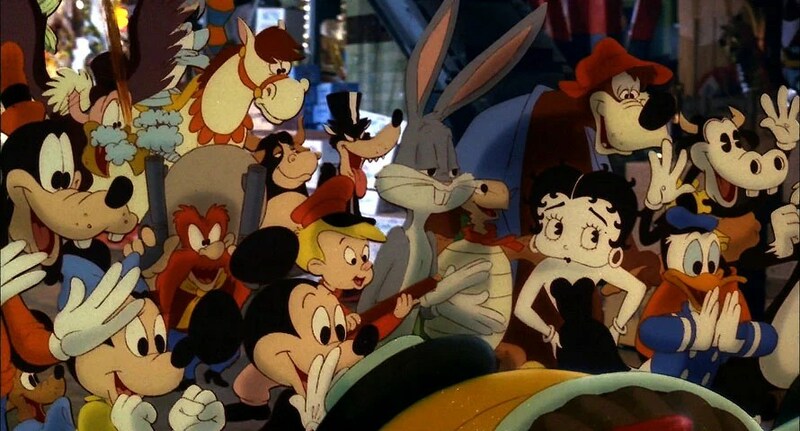 But it took the characters from both to sell the bizarre murder mystery of Who Framed Roger Rabbit? to the fans. There have been plenty of live action/cartoon crossovers, but this one was notable for also crossing over various “rival” franchises too, and even including characters from other studios. Roger Rabbit, a ‘toon working in the real world, is framed for murder and his only hope is human detective Eddie Valiant. Touching on adult themes (including the massive impact of the dismantling of the Los Angeles public tram system), it depicts Hollywood neighbouring ToonTown, and so many familiar animated legends appear just to prove it. Disney’s Donald Duck and WB Looney Tunes’ Daffy Duck duel with pianos, while Paramount’s Betty Boop serves drinks. Mickey Mouse, Bugs Bunny, Universal’s Woody Woodpecker and even the legendary Koko the Clown all get to share screen time. In hindsight, Marvel doing an Avengers movie sounds like common sense. Who wouldn’t want to see Earth’s Mightiest Heroes on the big screen? But at the time, Marvel was only just getting out of the slump which had plagued its film projects for years. 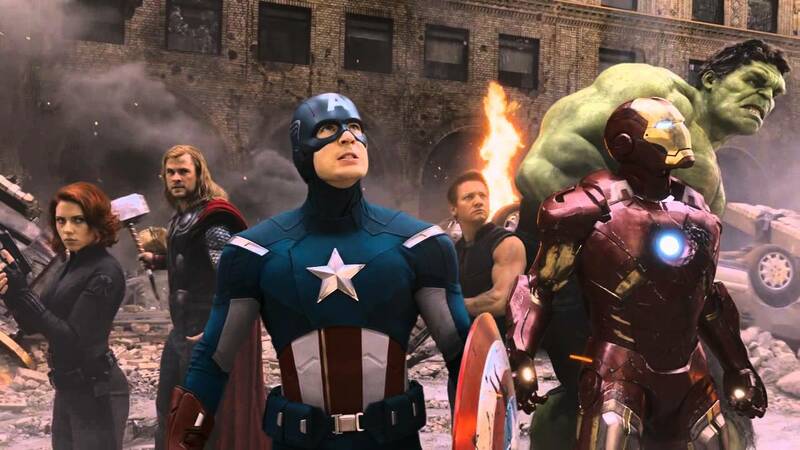 After teasing a future live action Avengers at the end of the surprise smash hit Iron Man, a cinematic universe was brought to life giving many Avengers key players their own films, The Incredible Hulk followed next, with less success, but with Thor and Captain America: The First Avenger, the Marvel Cinematic Universe’s future was secured. The Avengers managed to unite their heroes in an entertaining (but strangely forgettable) film, earning over US$1.5 billion. Now at sixteen films and six TV shows (and with much more to come), and having cumulatively totalled over US$12 billion in box office revenue, the MCU is a juggernaut. Having recently introduced Spider-Man into the equation too, it’s the biggest assembly of on-screen superheroes ever… or is it? For those who say that DC’s Justice League film is late getting to the party, it’s worth remembering that DC got it right first time in animated form. 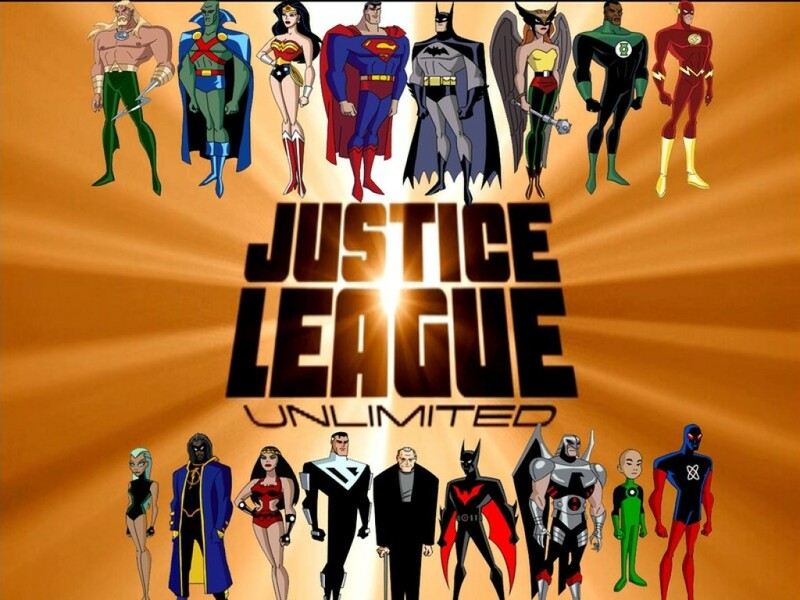 After the overwhelming success of the classic Batman animated series and then its sister-show Superman, the groundwork was laid for the highly respected Justice League animated TV series. With stories that were entertaining and intelligent enough for all ages, special emphasis was placed on story arcs and gave attention to other characters like Green Lantern, the Flash and Wonder Woman. With additional shows Static Shock and Batman Beyond helping to flesh out the DC Animated Universe, the biggest crossover was still to come – Justice League Unlimited. Boosting the JL’s roster with several dozen more superheroes, it managed to highlight some of the lesser-known characters in the DCU, from Steel, Booster Gold and Hawk & Dove to Green Arrow, The Question and the Shining Knight. It still stands as one of the best animated series ever, and is the perfect primer for anyone interested in learning more about the DCU. This was a comic book crossover which took nearly 25 years to pull off. After the legendary Superman/Amazing Spider-Man comic book crossover in 1976, anything seemed possible. In 1979, plans were afoot to have the two biggest superhero teams in comics finally unite to solve a threat which could destroy both the Marvel and DC universes. By 1981 it was getting ready to be rolled out… and then things fell apart, with both sides claiming that the other wasn’t willing to play ball. It became the dream project that never was, and many feared that they would never see it come to light. It wasn’t until 2003 that the crossover finally hit the stands. The main story is something straight out of the ‘80s in terms of a contest of champions with the various heroes trying to retrieve artefacts of power from each other’s worlds. 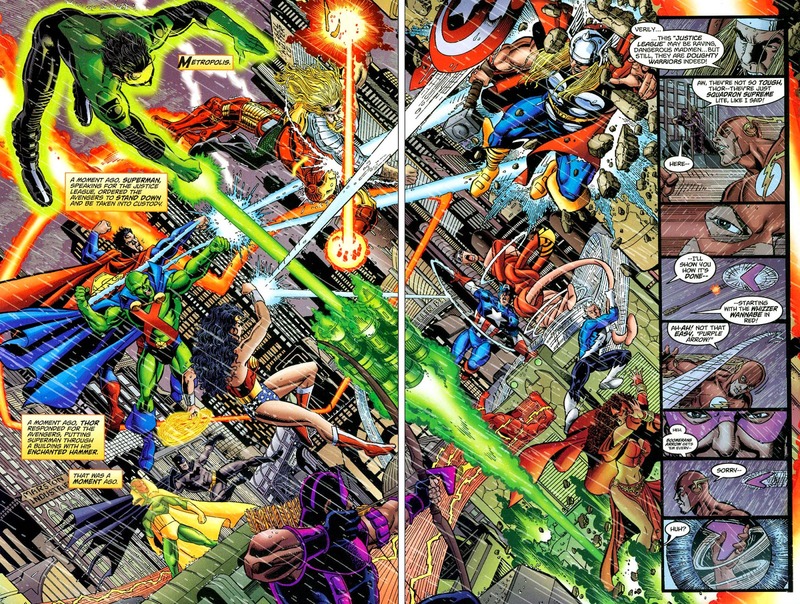 However, seeing what the Marvel and DC characters make of each other and their respective Earths is fascinating. Flash gets attacked for being a mutant in the Marvel U, while Captain America believes the JLA to be fascists who force the public to worship them. With cameos from just about every Leaguer and Avenger ever, it’s a treat for fans. Crossover TV shows are unusual enough, but it took Magnum and Jessica Fletcher’s combined deductive powers to solve a pair of murders in the episodes Novel Connection and Magnum On Ice. Magnum P.I. had already established itself as part of a larger TV universe when he crossed over with the sleuthing brothers Simon & Simon. 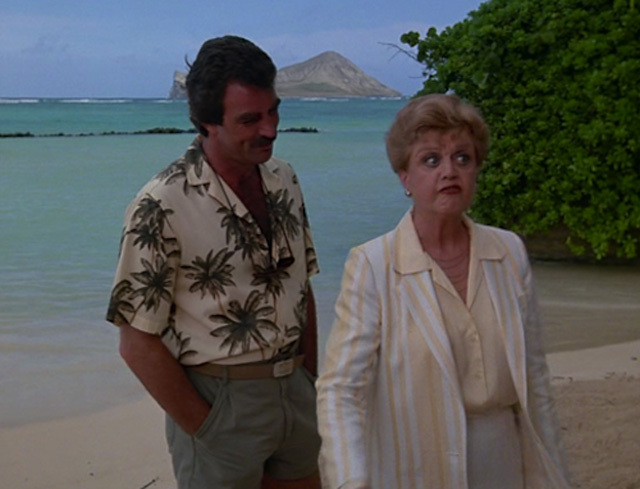 However, it wasn’t until Tom Selleck’s Magnum got to hang out with Angela Lansbury’s Fletcher that things got awkward, funny… and more than a little embarrassing in the episodes. Magnum instantly dismisses uptight Higgins’s friend Jessica as being nothing more than a novel writer who got lucky solving a crime or two, but viewers knew better. Also, since the playful Magnum lives his life by Higgins’s rules, he’s consigned to sit at the kiddie table during meals while Jessica sits with the grown-ups. The two separate episodes lay out the same murder mystery, and together they tell rather conflicting self-contained stories. By the end of it, Jessica gets the respect of Magnum as being cooler than she appears, while Magnum gets the respect of being smarter than Jessica first thought. Batman and Green Hornet should have been on the list :) And Batman and TMNT.